Last February, dozens of Willamette River users filed into the Wilsonville City Council chambers to voice their opinion on proposed legislation that would have cracked down on the use of wake enhancing devices on watersport boats which advocates said can be dangerous, cause erosion and damage docks. The proposal was later tweaked and then stalled during the legislative process. But — from waterfront homeowners, to representatives of the watersports industry, to river recreators — the evening demonstrated the palpable emotion felt on all sides. Despite their differences, two representatives of opposing sides of the disagreement worked collaboratively find a solution that they hoped would leave everyone feeling at least moderately satisfied. State Rep. Richard Vial enlisted Active Water Sports President Matt Radich to represent water sports constituents and Steve Gregg, a Wilsonville resident and the president of the Oregon River Safety and Preservation Alliance, to represent homeowners and those concerned about water safety. The duo crafted a list of proposed State Marine Board rule changes applicable on the Willamette River from mile 30 to 50, which is roughly between Newberg and West Linn, and Gregg said most of their initial proposal was adopted into the proposed Marine Board rule changes. "The proposal we worked on, people on both sides would say is not perfect but we would say it's something that is good for everybody because it gives everyone a section of what they want to (see happen)," Radich said. "It's the best we could come up with in keeping everyone's uses in mind." "From the tow sports user's perspective, it's opening up a lot of river we didn't have before," Radich said. "Instead of banning wake enhancing device, the idea is to keep them further away from docks and shore lines to minimize the impact of those things. It's opening up quite a bit of river for those uses and keeping people further away from the docks." Gregg was satisfied with lifting the ban on wake enhancing devices in part because he believes the rule changes would help organize the river more effectively so that canoers and swimmers would not cluster in the same area as wakeboarders and surfers. "That drove a lot of this, 'How can you (remove) conflicts to make the river a safer place?'" Gregg said. Also informing the rule changes was University of Tasmania Associate Professor Gregor MacFarlane, who was enlisted to conduct wake-production experiments on the Willamette River. The study found that distance can significantly weaken wake impact. "We learned a lot from waves energy study," Radich said. "When we're keeping wake surf boats 300 feet away from docks, it's about same energy as a normal boat at 100 feet (from the dock)." Additional rules include the disallowance of boats that are 18 feet or longer in certain zones between the Canby Ferry and river mile 50, requiring people operating a non motorized boat to operate within 100 feet of the shoreline from May 15 to Sept. 15 and the disallowance of boaters towing an inflatable device above a no-wake speed within 200 feet of a dock. Gregg said that because the Marine Board currently doesn't track boat weight and doesn't have data on erosion impact, imposing rules related to those two issues was infeasible. "With impacts to shoreline, we agree we don't have enough data to know how to manage wave energy so that it doesn't impact the banks," he said. "We don't know how much the bank can handle. Because of that it (creating rule changes addressing erosion) becomes a challenge. "I do believe we worked really hard to try to come up with rules to manage what we know." 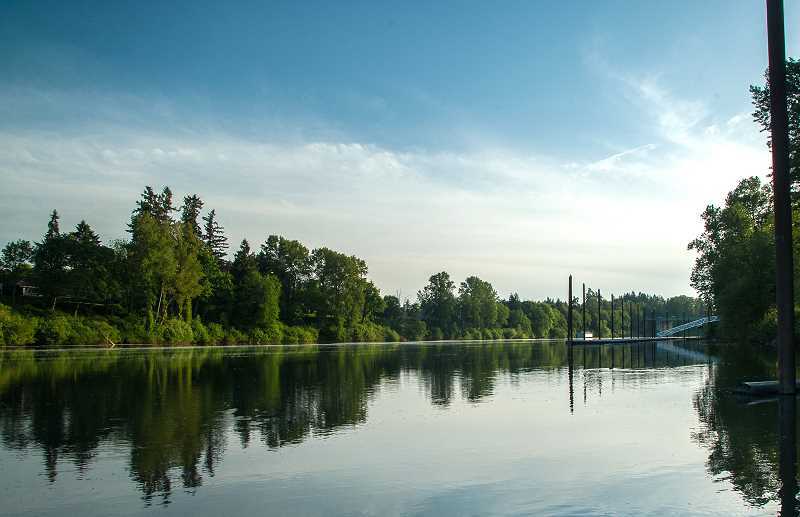 Willamette River homeowner and water sports advocate Darren Holsey believes the new rules will spread out boaters along the Willamette River. "As you got closer to Newberg, there was no reason to have things banned there especially if you're interested in safety," he said. "You can't have boats all in one spot and have any measure of safety." Gregg said he and Radich are also lobbying for legislation that would require boaters in this stretch of the Willamette River to pass certification training so that they know the rules prior to entering the river. "In a lot of cases people aren't aware of what rules are," Gregg said. "Hopefully education will be a key part of it." Relatedly, homeowners along the river have previously complained that there isn't enough law enforcement patrolling this section of the river. On top of that, enforcing the ban on wake enhancing devices is especially challenging because they're concealed within the boat. If the new rules are implemented, Radich said spotting violations will be much easier. "In the past you might not know they're running ballast (a wake enhancing device)," he said. "But you can certainly see if they're wakeboarding and wakesurfing (outside of designated zones)." Earlier this year, members of the ORSPA began to place buoys along the river to alert boaters about the current rule forbidding them from traveling above a no-wake speed within 100 feet of docks. Gregg isn't sure if more buoy placements would be needed if the rule changes go into effect but said there needs to signage identifying rules along the river. "How do you mark these zones is a concern we have," Gregg said. "It's to be determined the best way to do that." Katherine Farrell, a Wilsonville resident who lives along the river and is an ORSPA member, has previously voiced concerned about excessive wakes and overcrowded activity along the river. She reiterated that the process required compromise. "No one is going to be 100 percent satisfied with the results because it was based on compromises. ORSPA is committed to finding a solution that balances everyone's needs and minimizes adverse impacts to the Willamette River," she said. "I'm still hopeful we will find a good solution." Regardless of specifics, Gregg said the fact that the opposing sides came together to work on a proposal could be more impactful than the proposal itself. "Bringing the different groups together (to) collectively identify and solve issues is something that needs to continue and will become increasingly important as more people seek out opportunities to recreate on the river — especially as Wilsonville and the Metro area grows," he said.